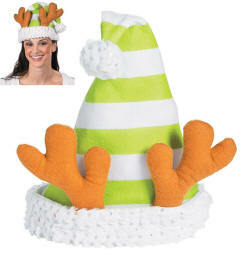 A fun twist on the traditional Santa hat! Wear this Christmas accessory to your holiday parties, to work or when you're out caroling. It's a cute way to make spirits brighter and everyone more festive! This snazzy, comfortable hat makes a great Secret Santa gift. Inside each hat is lined with white cloth for comfort. Each hat measures about 21 inches around the base (the part that fits your head).